Do You Have Prospects or Suspects? 10 Ways to Know the Difference. Too many prospecting pipelines are plugged. They’re plugged with suspects taking up valuable time. Keeping the pipeline full of only great prospects allows it to move faster and does not require the pipeline to be as big. It’s better to have a narrow fast-moving pipeline than a large slow-moving pipeline. In both the short-term and long-term, the narrow pipeline that is fast moving will reward you with more sales and better (more profitable!) sales. You’ll close more profitable deals, because the prospects with whom you’re working are motivated to do business with you. 1. Prospects have a timeline for making a decision. 2. Prospects reveal internal information. 3. Prospects engage at a deep level. 4. Prospects provide critical information. 5. Prospects answer questions directly. 6. Suspects take information, but don’t engage. 7. Suspects never share valuable information. 8. Suspects won’t provide direct answers. 9. Suspects are unclear about buying timelines. 10. Suspects raise obstacles that don’t hold value. Be sure to download the infographic with these 10 spelled out in a colorful manner to help you keep your eye out for discerning whether you are dealing with a prospect or a suspect! You can get the infographic at this link. Prospecting doesn’t have to be difficult when we focus from the beginning on making sure those we’re dealing with are capable of buying from us. There is nothing worse than wasting time dealing with somebody who in the end is nothing more than a prospect. If the person doesn’t have a timeline for making a decision and is not willing to share with you internal information you can with 98% certainly know they are nothing more than a suspect. Don’t forget to download the infographic! PrevPreviousExecutive Sales Leader Briefing: Do Leaders Think Big Enough? 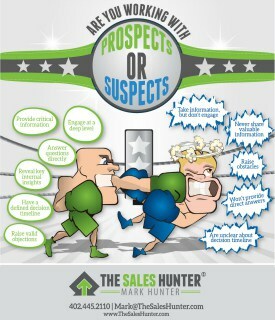 Mark great overview and definition of Prospects or Suspects. How do evaluate and determine the level of interest in potential clients and customers. Prospects should not be future suspects. Good content as always. Great Content. This is great. Thank you for sharing it. Number 10 is the most important to us. Non prospects that are in the way need to be removed from your sales process.